Free parking is available at Bob Christensen Reserve for up to 96 hours for caravans and recreational vehicles (self-contained) only. 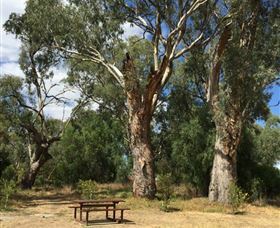 Bob Christensen Reserve is located on the Macquarie River within a five minute drive from Warren and there is a public dump point and potable water tap at Oxley Park on the Oxley Highway, Warren. With wide, open space for self-contained vehicle parking, a boat ramp, covered picnic table and benches, Bob Christensen Reserve is a place that visitors often return to. 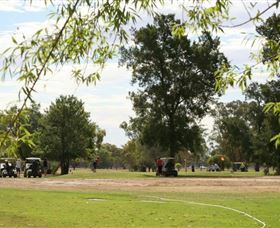 Visit the Warren Golf Club on the Oxley Highway and play on a mixture of grass and sand greens. The 18 hole golf course has beautiful vistas of the Gunningbar Creek and outdoor play equipment to keep children entertained. Cool down after your game with a refreshing beverage and stay on to dine with family and friends at Benny's Chinese Restaurant. 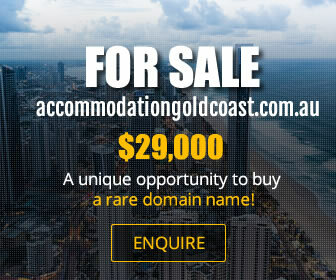 Located on the outskirts of Warren on the Oxley Highway is the Tiger Bay Wetlands. 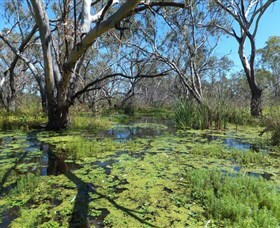 The wetlands are a natural overflow of the Macquarie River system and home to numerous species of birds and aquatic flora. Some of the many birds that have been seen here include Plum-headed Finches, Spotted Bowerbird, various egret and heron species, ducks, crakes and ibis. The Macquarie valley, in the heart of New South Wales is one of the State's, and indeed Australia's, best kept secrets, until now. Macquarie River Trails is designed to let you explore the many attractions and wonders of this rich farming region, one that is blessed with a vibrant river, friendly people and a laid back lifestyle. The Macquarie River Trails takes in the area from Lake Burrendong near Wellington, downstream along the Macquarie River through Dubbo, Narromine and Warren to the Macquarie Marshes. There are close to 200 sites and attractions in this area organised under eleven 'trails' - river, nature, heritage, local produce, cycling, fishing, art, bird watching, education, riverbeds and tucker. Relax, recover, unwind, discover is their slogan! If you only spend a week, you'll probably have to come back. But that's okay, you're welcome anytime. Make sure to get the downloadable app to guide you.